The Nationals had a Top-10 Bullpen in 2018; What will it look like in 2019? Measuring a bullpen statistically is tricky business because looks stats can be deceiving. ERA is generally a stat that does not tell the full story as relievers will tell you as one awful outing will skew the stat plus inherited runners go against the starting pitcher’s ERA. The Nationals had the 2nd best save % at 74.07% and the 9th best WHIP at 1.27 and the 15th best bullpen ERA at 4.05. So they were near the tops of all bullpens in the Major Leagues if saves and WHIP are your thing. But MLB Trade Rumors put the Nats on their 2018 list of worst bullpens based solely on WAR which was 25th in the Majors. Yuck! Come on. You can’t judge the Nats bullpen on WAR for several reasons. First off, WAR is cumulative and the Nats bullpen was not used as much as twenty-eight other teams because the Nats starters went deeper into ball games. Also did they separate out Greg Holland‘s stats before he came to DC? That is debatable to color the entire bullpen as underwhelming although there were certainly points in time where that was true but measuring the season as a whole the bullpen converted saves to rank second in the Majors and had the ninth best WHIP which are two of the stats that relievers can control compared to some of the others. There are a few interesting names left in free agency, and somehow Craig Kimbrel has been linked to the Nats. That seems to be a head-scratcher but certainly intriguing if true. The bullpen could look like this (below) but the competition will center on the last spot if you believe Sammy Solis makes the team. Out are Ryan Madson, Greg Holland, Shawn Kelley, and Brandon Kintzler, and the team barely got to know Kelvin Herrera. In are Trevor Rosenthal and Kyle Barraclough. Comparatively, this bullpen basically just swapped in Rosenthal for Madson and Barraclough for Kintzler/Kelley et al. To have these new acquisitions with extensive closing experience, it gives manager Dave Martinez more options after he dealt with internal strife last year where there were rumors of relievers who were running their mouths to the media and closer Sean Doolittle suffered a foot injury that sidelined him most of the second half of the season. While adding Barraclough via a trade, Rizzo’s big move was signing Trevor Rosenthal to a $7 million guarantee plus incentives in free agency. Rosenthal who is just twenty-eight sat out all of last year recovering from Tommy John surgery, and if he returns to form he will be a bargain. Barraclough is scheduled for an arbitration hearing as he has not come to terms yet with the team on his 2019 salary. 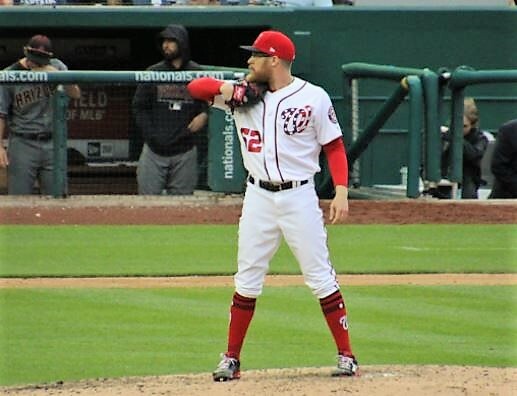 Besides questions on who the lefty specialist(s) would be, you have to wonder if this will be the year the Nats have a long-man in the bullpen? Many have suggested Joe Ross in the past as he returns from his 2017 TJ surgery and will be on an innings limit this season. Of course Jimmy Cordero and Austen Williams made their debuts in 2018 and will serve as extra depth plus Austin Adams and Trevor Gott are Nats property and are still on the 40-man roster. Rizzo added depth with Tanner Rainey who was acquired from the Reds for Tanner Roark, and the G.M. also added minor league signings Vidal Nuno and J.J. Hoover. Rizzo added minor league closer James Bourque to the 40-man roster giving the Nats added 40-man depth with Glover and Suero. If Sammy Solis can find the right balance, that would be a boost for the team. Manager Dave Martinez admitted that he made some mistakes handling Solis, and there were other missteps during the 2018 campaign where Madson pitched three days in a row and appeared to hurt himself, and Shawn Kelley spiked his glove on the mound after a meltdown leading to his departure. With Rosenthal and Barraclough in the mix, they can contribute high leverage success, this 2019 bullpen can improve upon its predecessors who have headed to the postseasons of years past. On paper, if this bullpen is healthy, the Nats should be one of the best in the Majors for 2019.